I had a lovely dinner of venison steak with a leaf salad and a bowl of delicately spiced tomato soup. There were fresh peaches and plums and white bread with sweet cream butter. Though I didn’t even ask for it, I was served several glasses of an excellent dark Vintish wine. Then I retired to my rooms where I slept like a dead man, lost in the vastness of my new feather bed. Bread and butter pudding is the epitome of homeliness to me; a fitting pudding to celebrate the occasion of Kvothe earning himself a home. My food speculation here is that he rustles it up for Old Cob and co. at the Waystone in later years, harking back to this formative experience of sweet relief. Special equipment: Small baking dish – mine was 11 cm x 17 cm. Adjust the quantity of the ingredients above relative to the size of your baking dish. Preheat oven to 175°C (350°F) fan assisted. Pop your egg yolks in a jug. Remove the crusts from the bread, butter it on both sides and remove the crusts. Slice the bread in half diagonally to form two triangles. Arrange the bread neatly along the length of the baking dish. 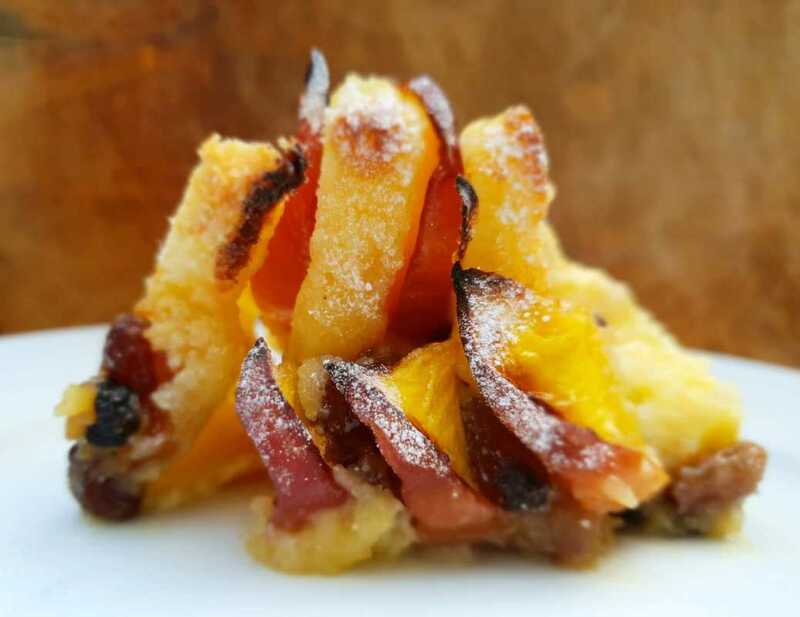 Put your peach slices and diced prunes in between each piece of bread so they're evenly distributed. Set aside. Heat the cream and sugar in a saucepan on a low-medium heat until the sugar has dissolved (around 5 minutes), stirring regularly. Remove from the heat. Add the sweet cream to the egg yolks, whisking vigorously as you pour. This will make a butter-yellow custard. 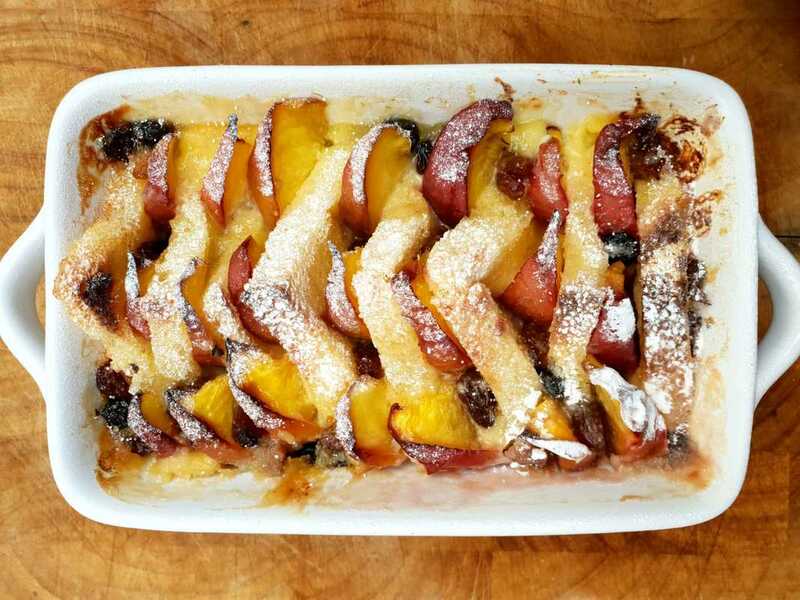 Pour the custard into the baking dish with bread, peaches and prunes. It should reach near the top of the baking dish without overflowing. Bake in the oven for 20 minutes. Remove from the oven and serve hot.